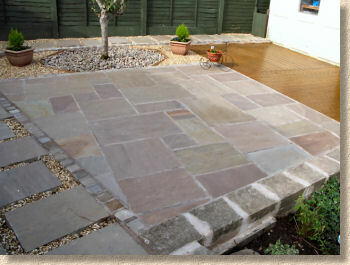 If you've laid your own flags/slabs to your patio or pathways following the advice given on this site, send in a picture or three and we'll add them to this page. Patrick Burton from Stoke commissioned a custom designed random layout and a couple of weeks later, his patio was complete. "All finally finished, even though rain stopped play several times. Everything worked to plan very nicely.